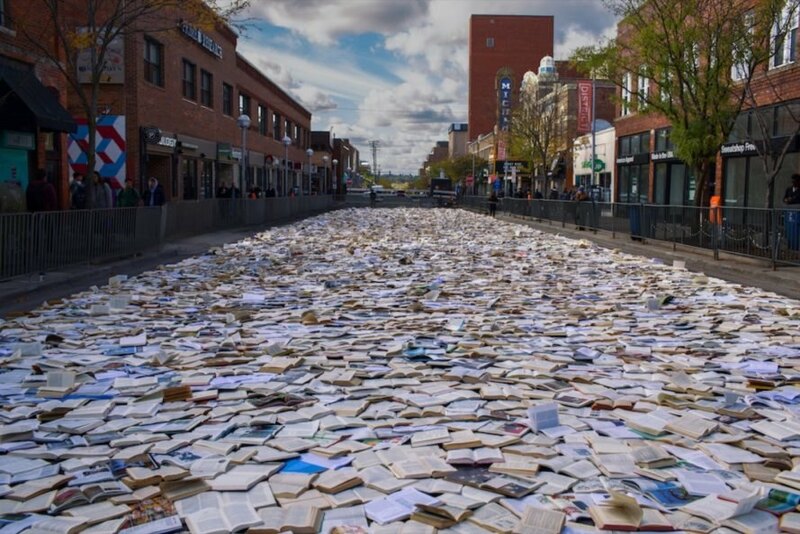 In their latest installment of Literature vs Traffic, Spanish design collective luzinterruptus transformed a major street in Ann Arbor, Michigan, into a glowing river of 11,000 books. Carried out to bring attention to the importance of pedestrian-friendly spaces, the large-scale installation turned an area typically marred by the sounds and pollution of cars into a quiet haven. At the end of the night, all the books were quickly “recycled” and taken home by visitors as a keepsake of the temporary event. Luzinterruptus’ most recent installation of Literature vs Traffic—the artwork had previously been displayed in Toronto, Melbourne, Madrid and New York—was briefly brought to life at Ann Arbor on October 23, 2018 thanks to the invitation of the University of Michigan Institute for the Humanities and its curator, Amanda Krugliak. The design collective felt the Michigan city was a fitting choice due to its reputation as a book loving college town and its proximity to Detroit, the birthplace of the U.S. automobile industry. The university organized a book donation drive to collect the 11,000 books used in the installation and also helped to temporarily close the major intersection of State Street and Liberty Street for 24 hours. A team of 90 volunteers also pitched in to help prepare and embed the books with tiny lights. 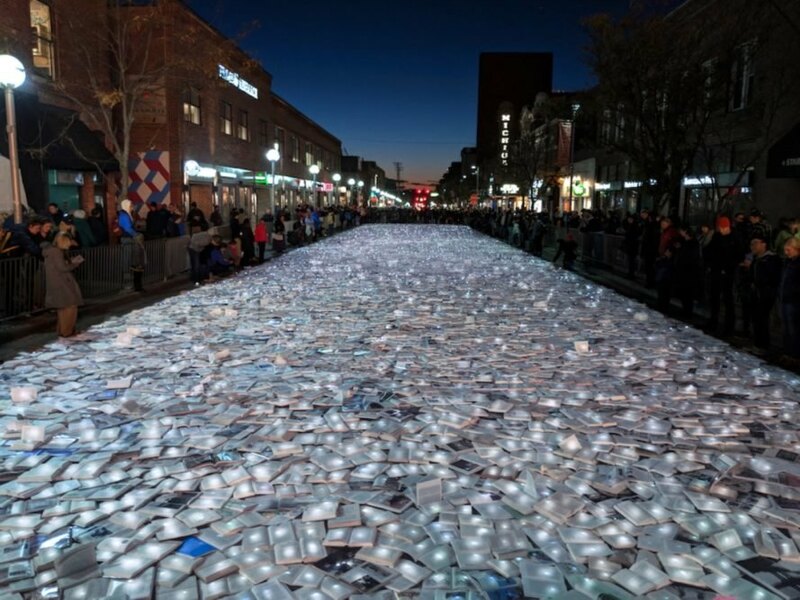 On October 23, a glowing river of books was laid out for a few hours until nightfall, when visitors were invited to enter the ‘river’ and take the books home. All the books disappeared in less than two hours, leaving the street clean and empty by midnight. The University of Michigan Institute for the Humanities invited Luzinterruptus to Ann Arbor to install the Literature vs Traffic piece. The installment lasted for 10 days. The piece had previously been installed in Toronto, Melbourne, Madrid and New York. 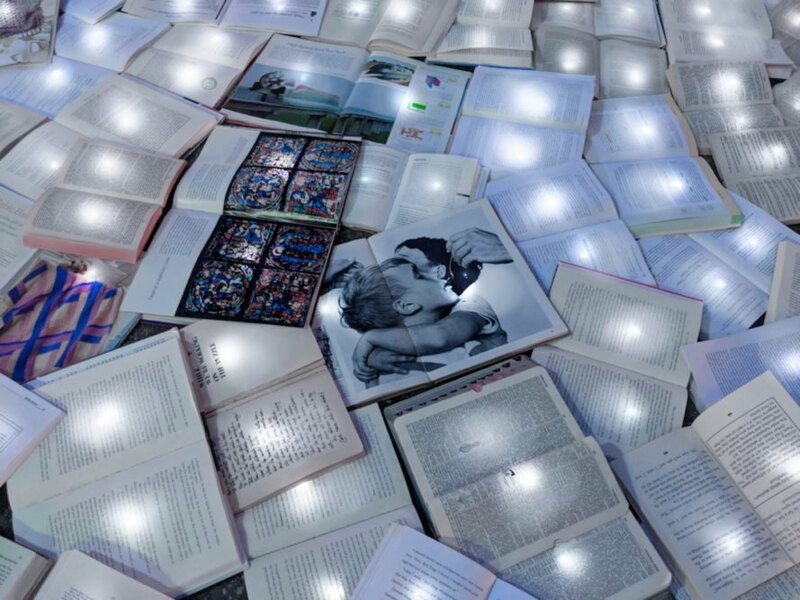 the installation is seen as a recyclable piece as visitors can take any books with them. The books were obtained by the university via a book drive. More than 10,000 books were donated to the university. The books were available for all those who wanted to keep them. 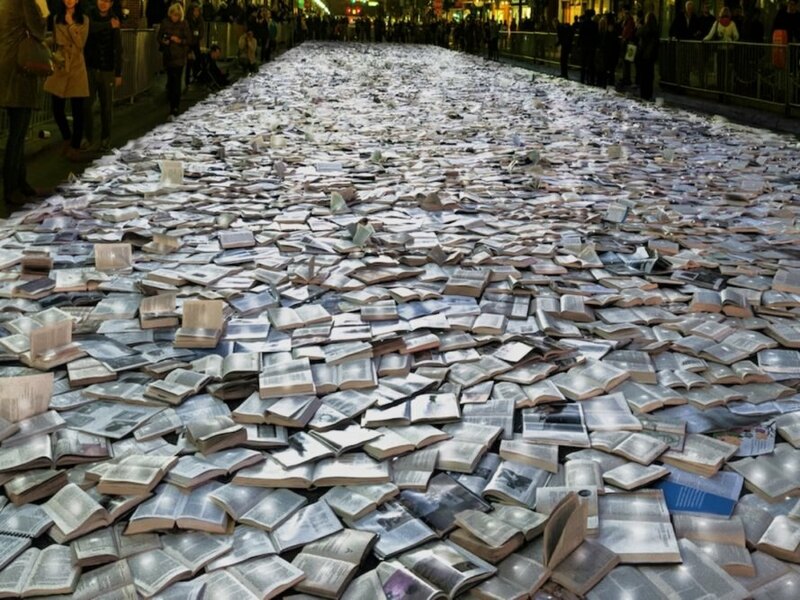 11,000 lighted books were laid on the street. Main streets were closed for 24 hours for the installation.